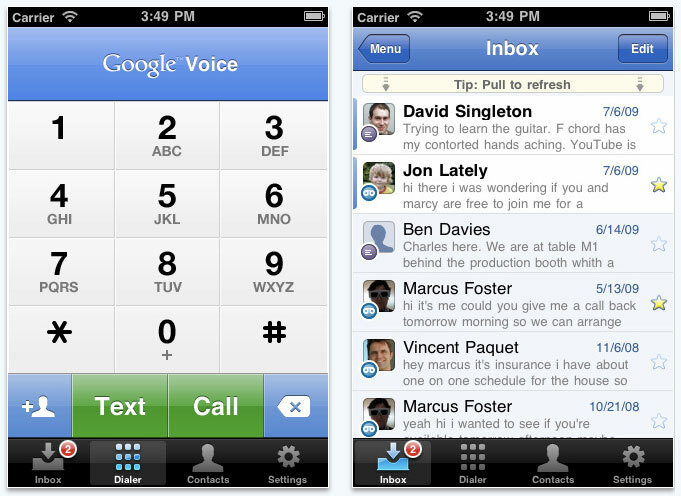 Google releases official Google Voice App for iPhone. Brings data-mine-able voice mail and text messages to iPhone. Access your Google Voice account right from your iPhone. Receive push notifications for new text or voicemail messages. Send free text messages to U.S. numbers and make international calls at cheap rates. Listen to your voicemail, read transcripts and manage your Google Voice inbox. Display your Google Voice number as caller ID when making calls. Call contacts from your iPhone Address Book or enter new numbers on the dialpad. OMG! Double Google Voice Apps Went All the Way! App Store Approved! This entry was posted on Tuesday, November 16th, 2010 at 4:00 pm	and is filed under iPhone Apps. You can follow any responses to this entry through the RSS 2.0 feed.